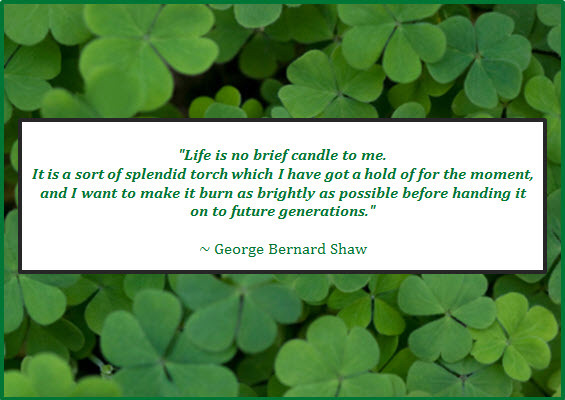 In the spirit of St. Patrick’s Day and all things Irish, I wanted to share some sage words from Irish Playwright/critic/political activist, George Bernard Shaw (b. 1856 in Dublin, Ireland; d. 1950 in Ayot St. Lawrence, England). Incidentally, George Bernard Shaw was a co-founder of the London School of Economics and a charter member of the Fabian Society. Founded in 1884, the Fabian Society is a middle-class organization in England, whose mission is to promote socialism through peaceful, non-revolutionary means. In 1925, Mr. Shaw was awarded the Nobel Prize for Literature. Although he accepted the award, he rejected the monetary prize and requested that it instead be allocated towards the translation of the works (from Swedish to English) of fellow playwright August Strindberg. If you want to have an online read of some of George Bernard Shaw’s works (novels, short stories or plays), visit: Readbooksonline.net. This entry was posted in heatherfromthegrove, inspiration, literati, visionaries, philanthropists & sheer brilliance, writer witticisms and tagged August Strindberg, Fabian Society, George Bernard Shaw, Heather Joan Marinos, Heather Marinos, heatherfromthegrove, London School of Economics, Nobel Prize for Literature. Bookmark the permalink.